I’ve created some pages of bathroom layouts to help you on your way on your building or remodeling project. Well designed bathrooms are an important part of a well designed home. And the thing about bathroom layouts is that they can’t be changed without huge expense and upheaval once they’re built. Check out the principles of good bathroom design. You can find more detail on all the symbols used in these bathroom pages on the floor plan symbols page. On this page we’ll go over the principles of good bathroom design, bathroom design considerations and decisions on bathroom fixtures. The bathroom must have sufficient space to use the bathroom, not just space for the fixtures. The door to the bathroom must be easy to move around and there should be space for taking clothes on and off and enough room for a people to dry themselves. There needs to be appropriate storage, accessories (mirror please) and counter space. 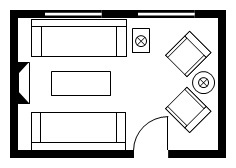 The bathroom needs to be located in a private position in the floor plan within easy reach of the bedrooms. Access to natural light if possible and are well lit. Located efficiently next door to or above or below other rooms using water such as other bathrooms, the kitchen and the utility room. Here’s some more things that you should take into consideration when designing your bathroom layout. Try to think of your bathroom as having wet and dry zones. Wet zones are where the floor is likely to get wet (beside the bath and just outside the shower) and dry zones – well everywhere else. If possible, try to locate wet zones out of the path of dry zones. There’s nothing more annoying than having a shower, then coming back in 10 minutes later to brush your teeth and getting soggy feet. Will the toilet be in the same room or a separate room from the rest of the bathroom? This can be handy as it allows someone to have a shower at the same time as someone is using the WC. For daily washing showering has become the norm (except perhaps for babies). For many people having a bath is now considered a relaxing past time. So I’ve been thinking it might be an option to have a separate room just for the bath. Would raising the bath up a little, or sinking it into the floor add some design interest to your bathroom? Think about the line of site from the bathroom door. It’s best to keep the toilet away from the door to avoid it becoming the view if the bathroom door is left open. Consider having niches built in to the design. Niches can be useful for a storage cabinet, for storing items used in the shower or for displaying a plant or piece of art (waterproof of course). There’s the option of designing dividing walls in the bathroom for the shower walls, or to give the feeling of sectioning the wash basin area or water closet away from the rest of the bathroom. If you're installing a glass shower cubicle make sure the door handle isn't going to bang into it and smash it. Windows – you need privacy in your bathroom so if you have windows (in the wall as opposed to skylights) think about what glass you want in them – patterned or etched. 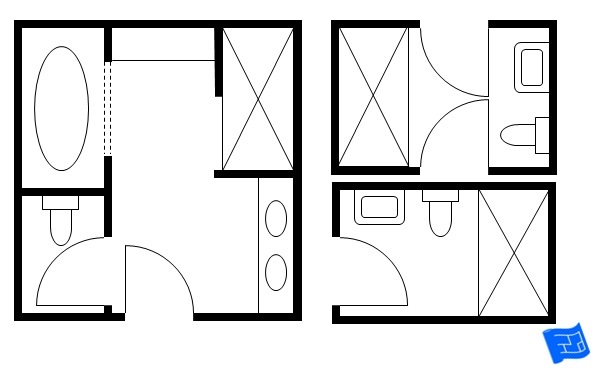 I guess it’s not completely essential to have daylight in a bathroom but if there’s no wall space open to a window see if light from a skylight or light pipe could be worked into the design. Is there room for a chair or seat in your bathroom layout? Do you want to incorporate plants into your bathroom layout? Decide on the type of toilet you want – wall mounted or floor mounted and whether or not you want the cistern built in to the wall, or mounted high on the wall. A high wall mounted option takes up the least space. Do you have room for a bath and a shower, or just a shower? If you’re going for a shower bath will you use a screen or a shower curtain? If you’re thinking of a shower screen just keep in mind that if you’re a bit of a neat freak you need to keep a squeegee in the shower to get rid of the drops. I like things neat but I also like things low maintenance so although it’s a bit old fashioned I’m a fan of the shower curtain – a pull to the side and it’s in its place and a quick wash in the washing machine every so often is all it needs to keep it in tip top condition. It’s also easily replaced if required. When it comes to the bath you could have it built in or free-standing or have a luxurious surround built. If you’re putting in a bath, have a think about whether or not you’ve got room for an island bath (one that sticks out into the room rather than being surrounded by wall on three sides) or a corner bath. Decide what kind of wash basin you want. You can choose to go wall mounted, or floor mounted with a pedestal, or there’s the built in vanity option. If you don’t go for the vanity option make sure you’ve made adequate provision for storage elsewhere in your bathroom layouts. To bidet, or not to bidet – that is the question. To find out more about the sizes of fixtures and clearance requirements in bathroom layouts have a look at the bathroom dimensions page.